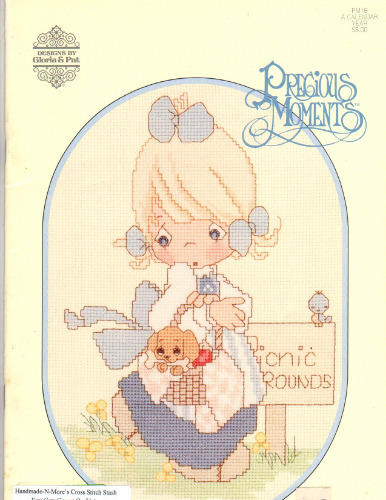 Designs by Gloria & Pat Precious Moments A Calendar Year Counted Cross Stitch Pattern booklet. This is the Day the Lord Has Made, This is My Father's World, Memories Are Made of This, Thank You Lord for Special Friends, My World is Buzzing with Delight, Life Can Be a Picnic, Celebrate Our Freedom, Let's Pool Our Resources, Lord Help Us Do Our Very Best, Take Time Out With Special Friends, Thank You Lord for Everything, Love is the Greatest Gift of All. New. Store sticker on cover. Some minor shelf wear to cover.